We are broadly interested in how the structure of ecological networks affects their stability and functioning, how networks respond to perturbations, and more generally their dynamics and evolution. 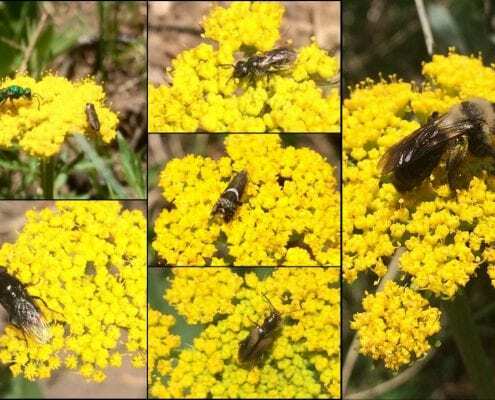 Most of our work focuses on mutualistic networks, particularly pollination networks, but we are interested in all kinds of ecological interactions, and especially in combining multiple interaction types in the same network. A particular goal is to better integrate theory and empirical data, an integration that remains rare in mutualistic network studies. Most models of mutualistic networks assume that mutualisms across groups are the only interactions occurring. Here, we show that integrating plant-plant competition in pollination-network models decreases network robustness to secondary extinctions. A key conundrum in ecological network science is how networks balance efficient functioning with the redundancy needed for stability. In collaboration with Fernanda Valdovinos (U. Michigan) and Phillip Staniczenko (SESYNC), we are investigating how qualitative network topology (presence or absence of links) interacts with quantitative network structure (interaction intensity) to achieve this balancing act. Our ongoing work integrates mathematical modeling (led by post-doc Alva Curtsdotter) and field work at the Rocky Mountain Biological Laboratory (involving graduate students Xingwen Loy and Connor Morozumi). How environmental changes will affect ecological network structure and functioning is a key question in the Anthropocene. Led by graduate students Xingwen Loy and Connor Morozumi, we are investigating the effects of accelerated snowmelt—a key predicted effect of global climate change in montane systems—on pollination network structure and plant reproductive functioning, based at the Rocky Mountain Biological Laboratory. Climate change is particularly expected to lead to mismatches in the timing (phenology) of plants and pollinators, but whether and how these changes will affect structure and function of ecological systems is unknown. We are conducting this work with mathematical modeling and manipulative snowmelt experiments, using black shade cloth to speed up snowmelt in multiple replicate plots. Pilot work in spring / summer 2017 at RMBL showed proof-of-concept for our experimental approach. How environmental changes will affect ecological network structure and functioning is a key question in the Anthropocene. Led by graduate students Xingwen Loy [internal link] and Connor Morozumi [internal link], we are investigating the effects of accelerated snowmelt—a key predicted effect of global climate change in montane systems—on pollination network structure and plant reproductive functioning, based at the Rocky Mountain Biological Laboratory. Climate change is particularly expected to lead to mismatches in the timing (phenology) of plants and pollinators, but whether and how these changes will affect structure and function of ecological systems is unknown. We are conducting this work with mathematical modeling and manipulative snowmelt experiments, using black shade cloth to speed up snowmelt in multiple replicate plots. Pilot work in spring / summer 2017 at RMBL showed proof-of-concept for our experimental approach.